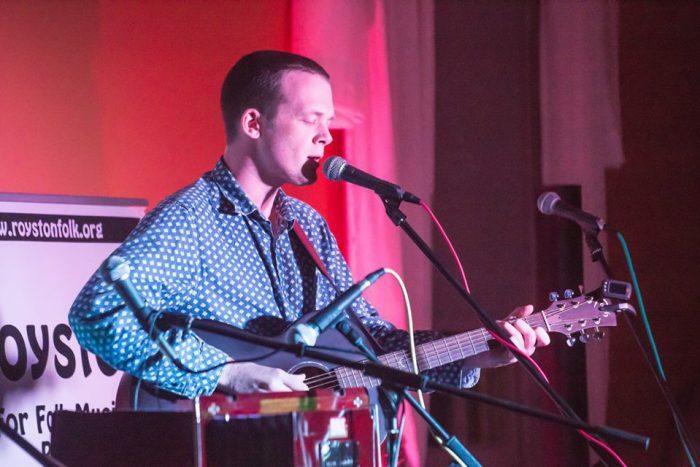 Over the past five years, Royston Folk Club has grown into one of the most welcoming and eclectic venues for acoustic music in the country. We want that music to continue – which is why in 2017 we’re launching our first Young Artist Competition! Young Artists Competition with a £500 winners prize (or mentored – studio time). PLUS a runners up prize of £250 sponsored by Royston Creative Arts. Entry will be to instrumentalists or performing songwriters up to the age of 25. Contestants can sing their own songs or covers, and perform solo or in a duo. The competition will run at our regular Showcase nights, over 8 months from April to November 2017. The Showcases are held once a month, and we will feature one or two contestants at each Showcase. The competition will be judged by a mixed age group, with no particular musical loyalties. Some will be our club regulars (the legendary Roystoneers); others will be well-known artists on the local acoustic and folk circuit. In the event of a tie, the casting vote will go to the club organisers. A running review of the contest will be maintained on the Royston Folk Club Facebook Group but the marks and winners will not be revealed until the end of November. 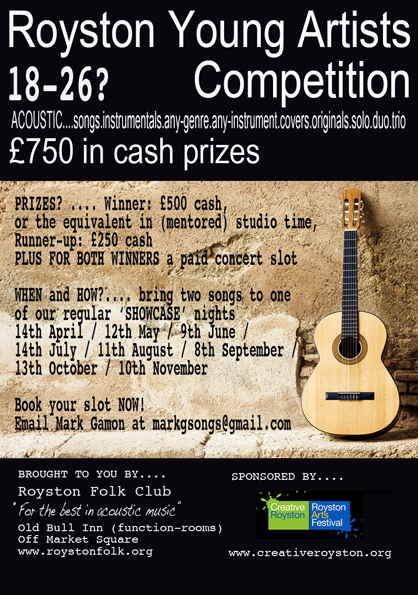 To enter, contact Mark Gamon on markgsongs@gmail.com. Tell us your name, age, musical style, and which dates you’d like to join us on (see below). Please include recordings or videos. Don’t worry about the quality: this is mainly to give us an idea which nights to slot you in. If you know someone and they’re being bashful, give them a nudge. And tell your friends!